Short-term traders call volatility their friend. There is a reason why. The up and down movement of stock prices makes it difficult to make money by buying and holding for extended periods unless the market assumes a sustainable upward trend. As such, when markets are relatively choppy like they are now, investors try to capitalize on volatility by trading short-term. Nonetheless, as more companies continue to report the December quarter results, investors will be expecting the S&P 500 Index, the Dow Jones Industrial Index and Nasdaq Composite to post some gains. 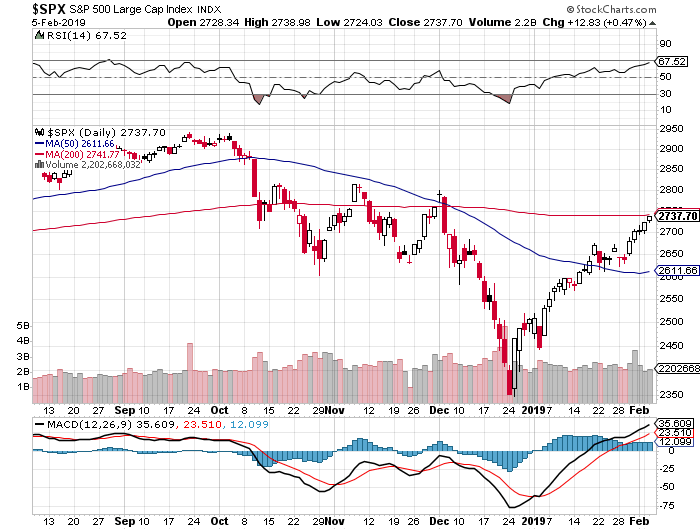 In fact, looking at the S&P 500 Index (SPX) chart, the SPX and its counterparts have been on an upward movement since the post-Christmas period. The question will be whether those gains will be sustainable for the next few months given the overall market outlook. Currently, the results pouring in seem to have calmed the market a bit. However, this does not completely wipe out short-term trading opportunities. So, how do you trade the current market volatility? Investors will be looking for opportunities to capitalize on the short-term gains witnessed during the earnings season without committing to owning the stock on a long-term basis. One way of achieving this is through the regular broker, but this might require a substantial financial outlay. As such, some traders will be looking for alternative ways. This is where stock CFDs trading are likely to come in handy as they offer investors more opportunities to trade the volatility without necessarily having to commit a significant level of their capital. In addition, there are fewer fees involved. In a recent Plus500 review, it is revealed that the CFD broker does not charge dealing commissions, which a trader pays when trading via a traditional stockbroker. Most CFD brokers do not charge additional fees but only rely on the spread for profits, which is why most traders outside of the U.S. continue to choose them ahead of traditional stockbrokers. Some are also attracted by the leverage provided, which means that traders can trade in high volumes.